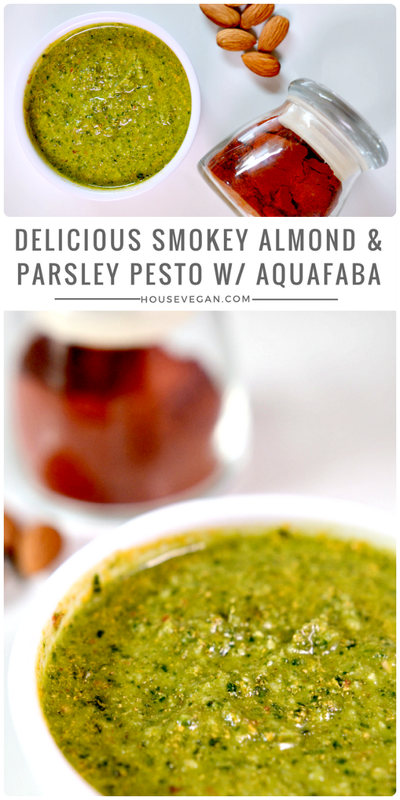 Before telling you about this Smokey Almond and Parsley Pesto w/ Aquafaba we gotta go to that good ol' disclaimer: Housevegan.com is a participant in the Amazon Services LLC Associates Program, an affiliate advertising program designed to provide a means for sites to earn advertising fees by advertising and linking to Amazon.com. This post contains Amazon affiliate links. We had such a nice Easter! Did you? We drove about an hour and a half through beautiful Texas countryside to my aunt's house for lunch with family. Although my family isn't vegan, they always have vegan food available for me. 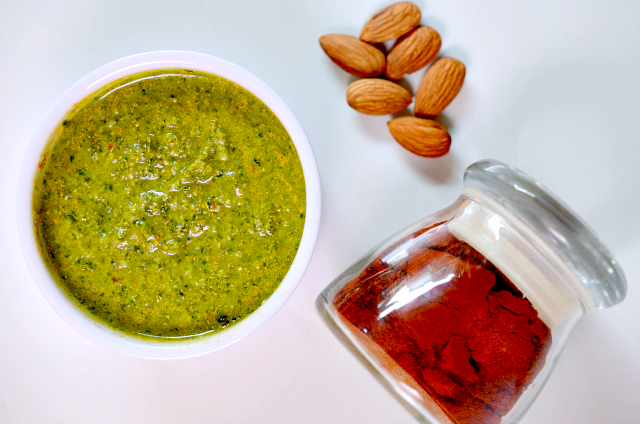 I ate lots of fruit, Grandma's Syrian Bread, salad, vegan almond cookies, Lemon Coconut Rice Crispy Treats, and pasta made with this delicious oil-free Smokey Almond and Parsley Pesto w/ Aquafaba. 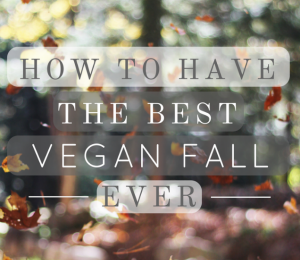 Are you like "What's aquafaba?"? No worries, I can tell you all about it. Aquafaba is the cooking liquid of beans and legumes. That stuff you drain after you cook a pot or open a can of beans? 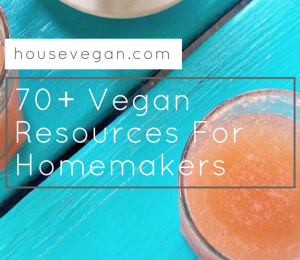 That liquid can be used in place of eggs in baked goods, or to make vegan meringue, mayonnaise, and even non-dairy butter. I'd heard of people using aquafaba in place of oil, and I was curious to see how well it would do in something like pesto. 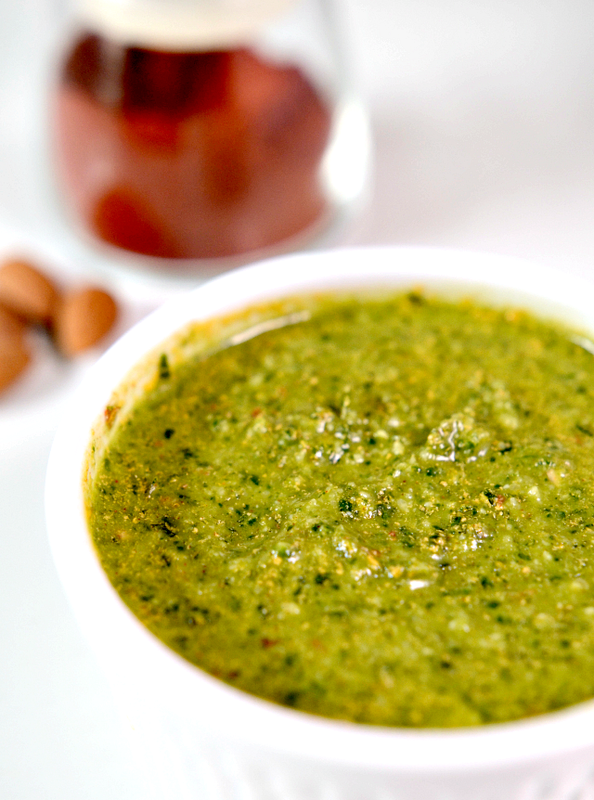 Although basil pesto is my favorite pesto, I'm a big fan of pestos made with alternative herbs, greens, and nuts. This Smokey Almond and Parsley Pesto w/ Aquafaba might be the most playful pesto recipe I've ever written, and it's certainly one of the tastiest. I just love how pesto's versatility and simplicity makes it ideal for experimentation. With basil season still a couple of months away I knew that parsley was going to be the base for my aquafaba pesto. Parsley is a wonderfully bright herb that doesn't clash with too many flavors. In my opinion, it's ideal for basil-free pesto. 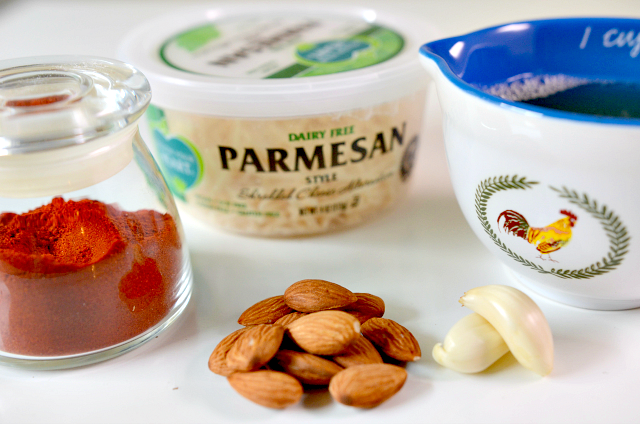 Most of the other ingredients in this recipe are just what you'd expect to find: garlic, nuts (almonds are what I had on hand), and parmesan. 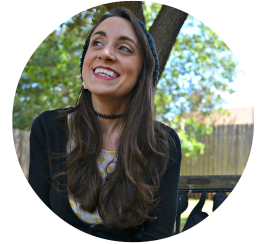 I used Follow Your Heart's Dairy Free Parmesan, a product that I've been super excited to try for months. I have such fond childhood memories of shaking processed powdered cheese from a can all over my pizza and pasta. Truthfully, the only cheese I that liked back then was the processed kind. I wish I could say that I have fond memories of freshly grating parmesan all over my food, but what can I say? We were green can people. Follow Your Heart's parmesan is more reminiscent of the fresh stuff, but its salty, nutty flavor still hits my nostalgic buttons. Does it taste exactly like dairy parmesan? I have no idea, but it's for sure really tasty on its own merit. 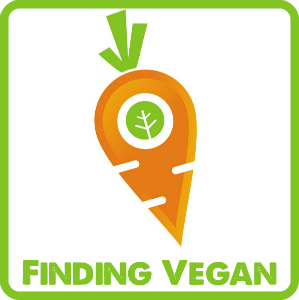 If you can find it, definitely give it a try. If not, it's totally fine. You can use nutritional yeast in this recipe, and it'll still taste great. The wildcard in this pesto was the aquafaba, and since we're buds I'm going to be honest with you. As the food processor full of ingredients swirled and buzzed I started to lose hope in this experiment. I expected it to come together like the easily emulsified pesto that I'm used to. However, the ingredients just sort of swam around in a pool of aquafaba without any indication that it would meld into something palatable. Cue the Charlie Brown sad music. All was not lost as I considered the machine I was working with. My teeny tiny food processor is an adorable add-on to my immersion blender, and is not even close to a high-powdered appliance. I transferred the pesto (more like pest-no, amirite?) to a blending cup, and used my immersion blender to finish the job. Viola! It came together beautifully. I added smoked paprika and salt, and tasted my new oil-free pesto. Delicious! Not quite as rich as traditional oil pesto, but the texture and flavor were great. It was smokey, savory and nutty, but also herby and bright. I'm officially calling aquafaba pesto a success. Just a note about using this pesto in pasta: It dries out quicker than pesto made with oil, so if you're using this pesto for pasta, it would be best to eat it right away. 1. 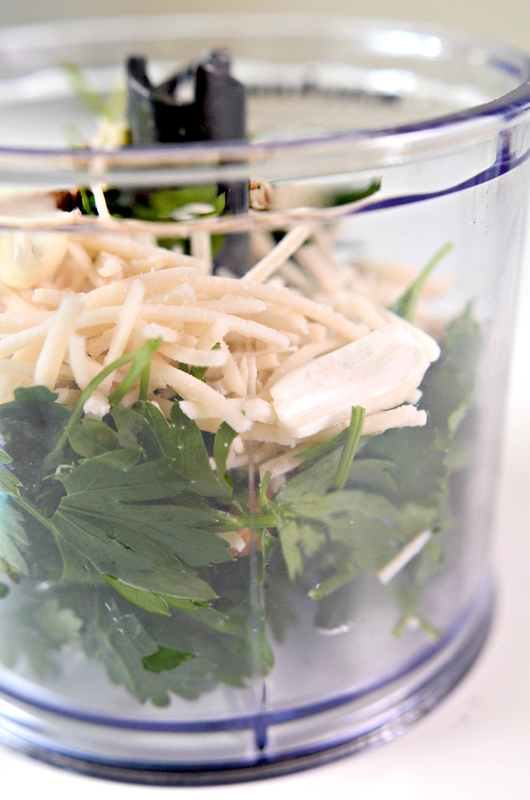 Add the parsley, garlic, almonds, and vegan parmesan (or nutritional yeast) to your food processor or blender. Pulse the processor until the mixture is broken down, and the almonds are thoroughly chopped. 2. With the food processor running add the aquafaba in a slow and steady stream. Continue to process the pesto until it is smooth enough for your liking. 3. Add the smoked paprika and salt to taste. 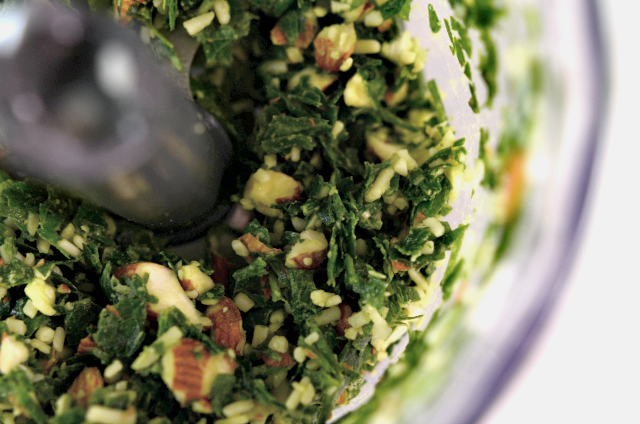 Store the pesto in an air-tight container in the fridge for up to four days. Let's be friends! 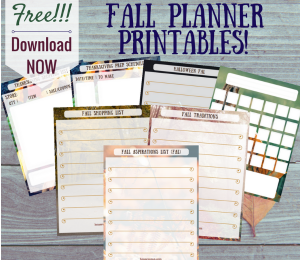 Follow HV on Facebook, Google+, Pinterest, Bloglovin' & Instagram! 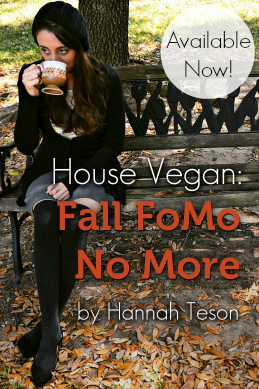 You can also get House Vegan posts delivered right to your inbox by using the opt-in option on the very top of this site!